Our top 5 thrifty decor and DIY projects. Thrifty decor and DIY is what fuels my fire here at Chatfield Court. I’ve done a lot of projects since I started the blog almost 5 years ago but the thrifty ones have turned out to be my favorite. I think that it’s the challenge of not only finding an inexpensive treasure, but also turning that treasure into something that I love. There’s been several projects that stand out in my mind. Some have been recently done, some a few years back, but all of them are well loved and still used in our home. 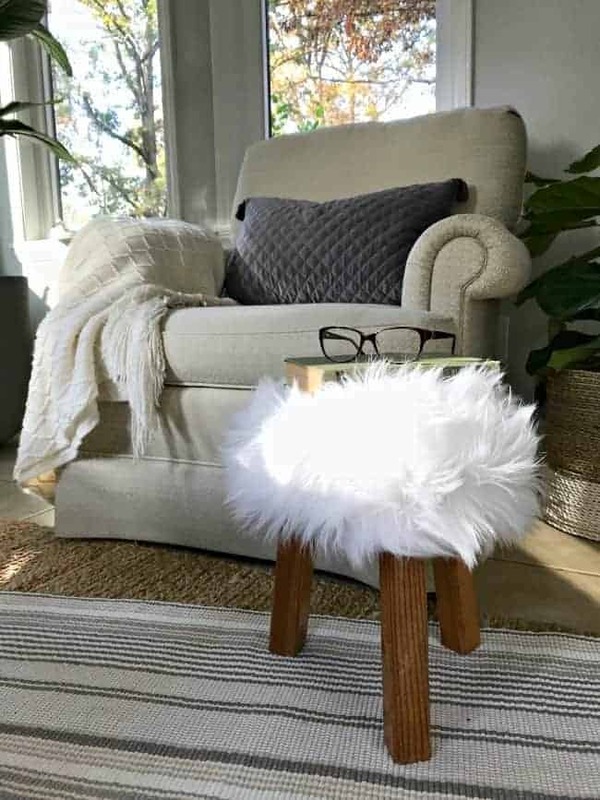 Let’s start with the hairy little monster, my DIY faux fur stool. This $2 find was transformed with just a bit of faux fur and now it has tons of personality. Can stools have personality? Why yes…yes they can. Even the hubs is a fan of this one. 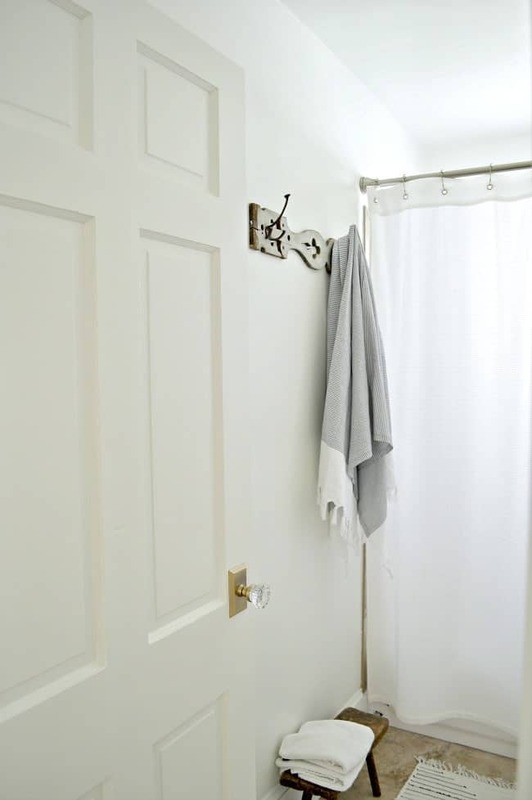 This former porch baluster has been a welcome addition to our small bathroom. I only bought it because I loved the shape and the price, $2. It took a while but I eventually turned it into the perfect towel rack. This project was done out of desperation. We needed a nightstand and I couldn’t find anything that would fit our small space. This $5 find was just supposed to be a temporary fix but it’s turned into a keeper. You can check out the before and after, here. This thrifty project is probably my favorite of them all. We were remodeling our galley kitchen, in our house in Illinois, and I really wanted a chalkboard. I was looking for a square mirror to transform but when I saw this lovely piece at a local thrift store, I couldn’t pass it up. It’s like an ever-changing piece of artwork for your wall. 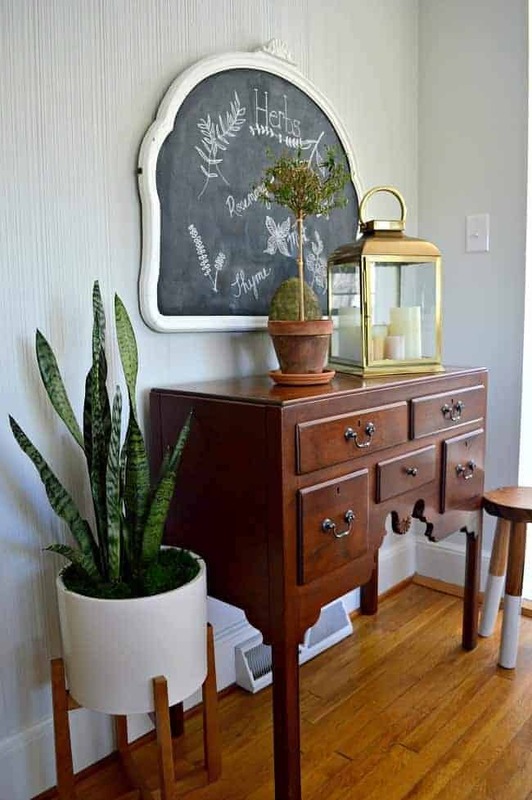 Check out my easy DIY thrifted mirror turned chalkboard. If you’ve been around for a while then you may know that I have a slight door obsession. It’s not the best obsession to have, especially if you live in a small house with limited storage space, but it is what it is. I have a few projects that have involved my found doors but this turned into one of my faves. Check out the before and after of our thrift store farmhouse door. You won’t believe the change this $20 find made. We also have a few other awesome door projects like our frosted glass bathroom door and our mirrored barn door for our newly built guest bedroom closet. As always, they were easy and thrifty projects. Oh…and the pink tulip wreath? It’s a project that I just finished. I call it “an explosion of pink”. Do you have any fave thrifty finds? I’d love to hear about them. 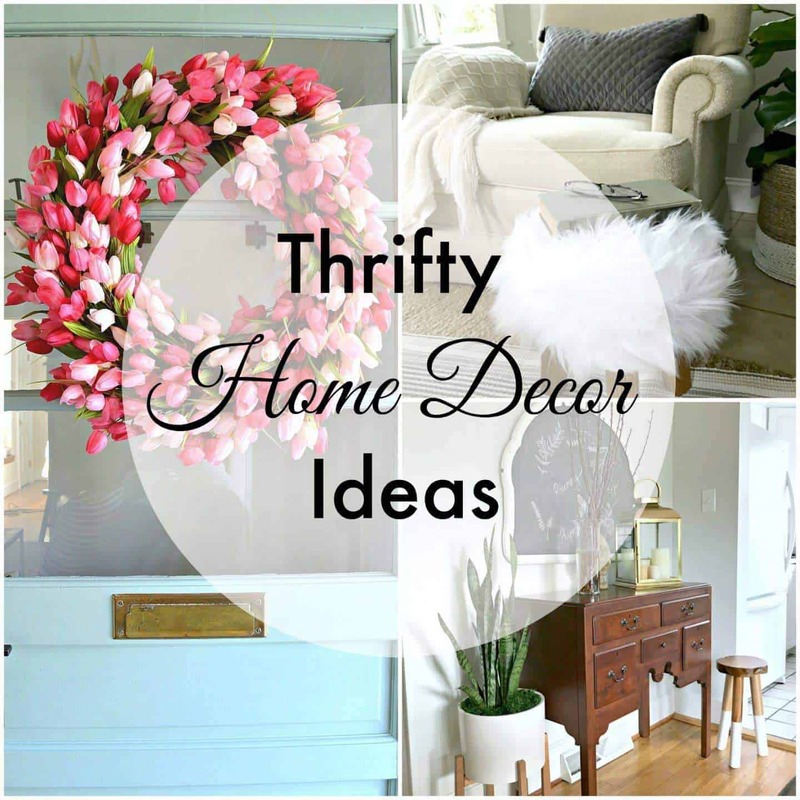 The Thrifty Style Team is sharing their fab thrifty decor ideas and projects, too. Stop by and check them out. I just found your blog through Worthing Court. I can’t wait to look through it more! Your projects are all great! I love thrifty decor projects too. I love finding old pieces and fixing them up. My favorite thrift store find was an old door I have in my family room I found years ago. I love hanging different wreaths on it for each season. kristi- you had me at hello at your beautiful front door. Thanks so much Laura! I really love our new front door. Such an improvement to the old one. 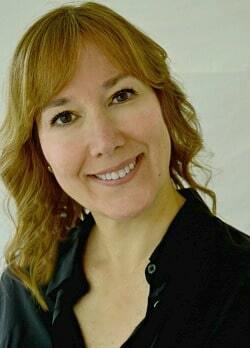 Kristi, I pronounce you queen of thrifty makeovers! I remember most of these but my fave is the furry stool! You are so talented! Hmm, I don’t remember the industrial nightstand and I thought I’ve seen everything of yours! LOL It turned out really cute and if you only have a small space it fits perfectly! Love it! Your gorgeous front door and wreath give me ALL the heart eyes! Awww, thanks so much Kristi, I appreciate it! I love all your thrifted projects – especially that nightstand! Absolutely gorgeous! You have had some wonderful ideas, you have truly inspired me, i loved the night stand, so cute. That door??!! That is amazing!!! 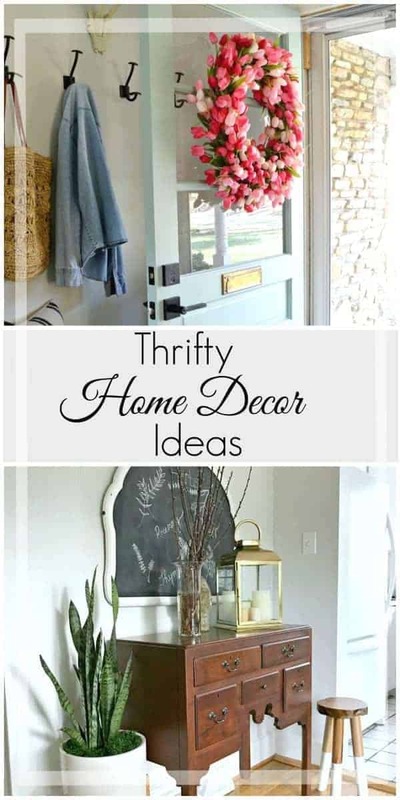 All of your thrifty projects are so fantastic! These are so great but that door with the wreath has to go……as in go into by car and come to my house!!! 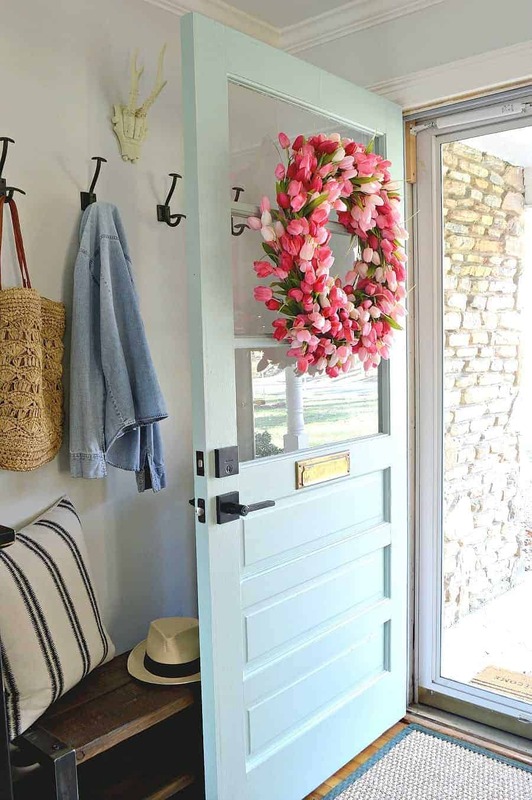 I need that door and wreath in my life asap! Ha, when I first read your comment I was like Ugh…has to go? Too funny! Thanks my friend. Kristi, you definitely have the touch! That little furry monster is one of my favorite stool makeovers ever!! 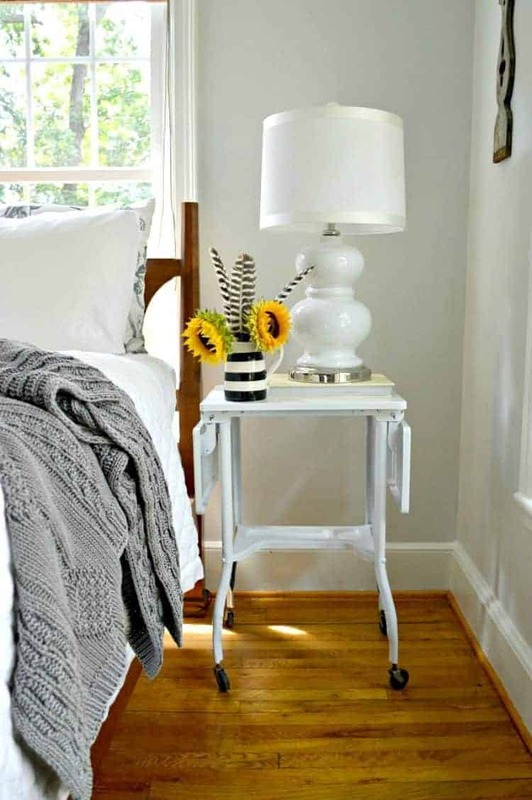 and I ADORE that little typewriter table that you turned into a fun and quirky nightstand!! Still crossing my fingers for you. I know that if you get it you will love making it your own. Somewhere in my shed ‘o schidt I have a little typewriter stand. I need to paint it up so its cute like yours. I love the tulip wreath—so pretty and fresh after an never ending winter. But my favorite of all your DIY is the mirror turned chalkboard. I loved it as a calendar. Wish it were available for sake???? Thanks so much! It’s been a long winter here too so the pink is nice to see when we come home. The chalkboard is my fave project too. I may bring the calendar back. I miss changing it out every month.